I turn my back for a moment…. 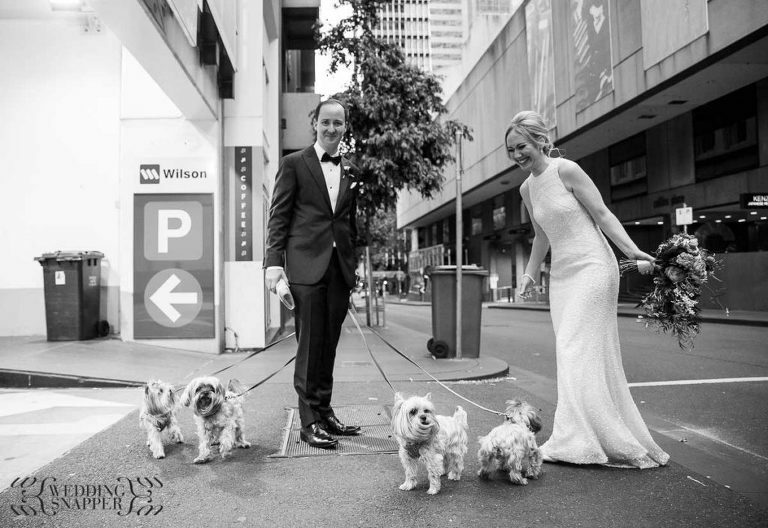 …and the groom somehow acquires a clutch purse and 4 small dogs! Having finished the portraits of the couple at the Botanical Gardens and ACDC Lane I thought it would just be a short walk up Flinders Lane to Rachel & Rhys’ wedding venue White Lane. I really get a kick out of the random moments that can occur on a wedding day and this photo probably sums up the mood of that particular day more than anything else I photographed. I love being surprised by the unplanned moments on a wedding day so if you’re open to letting the day unfold and having me photograph all the usual bits and bobs as well as some as the more candid moments in between then I’d love to chat with you! Think along the lines of relaxed wedding photography with a photojournalist or documentary style tilt. Kinda….